Get the most from your food gently cook and save valuable energy with ZWILLING Prime frying pans. The pan is made from SIGMA Clad, a five-layer material which distributes heat evenly up to the very edge of the pan. This premium piece of cookware remains stable as you cook, stopping food from sticking and evenly browns. As the aluminium core is such an effective heat retainer, this frying pan also helps you save energy while cooking reducing the amount of energy used. 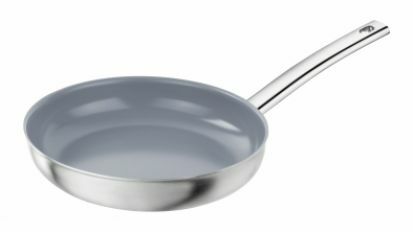 The Prime frying pan range can be used on all heat sources, including induction hobs. If accidentally overheated, the Ceraforce Ultra coating remains safe up to a temperature of 450°C. It is also free from PTFE and PFOA and should be washed by hand.